Vacations are just around the corner and you are planning for holidays but what if you don’t have a proper and spacious Backpack? Good quality backpacks are always necessary to enjoy any journey. A quality backpack must be spacious enough and secure so that it can fit all of your necessary items in a safe manner. Hence, nowadays different companies are working upon to make spacious, safe and secure rolling backpacks. The use of new and modern technology means that these backpacks are not like the conventional ones, instead of many new features have also been integrated into them. Now, no worries of carrying around the large bundle of keys, like a jailer, while traveling. Instead, you can put them in the keychain coin purse which is fitted with this bag. There are two main compartments inside the bag, three front zippered pockets, one net pocket and two side zippered pockets. The dual backpack straps ensure the tensile strength of your rolling backpack. So roll on now without any worries! This imported backpack has a large, multi-compartment and spacious design. A fully padded zone will fit in a usual 15-inch laptop and since this pocket is cushioned so your laptop will also be safe from sudden shocks and jerks.The smart media pocket also contains a headphone port so you can enjoy music while traveling. The corner mounted wheels provide a smooth rolling by the bag. A triangular clip is also attached at the front side of the bag so you can attach any item to it too. Need more color variety? Here it is. Everest brings you hot pink, turquoise, dark purple, black, navy, burgundy, gray and khaki colored backpacks for you. Chose what suits you the best! This is a rather simple and compact backpack for a relatively smaller journey. It is made up of 100% polyester, which tells you about its strength itself. It has not many features integrated into it but the polyester lining makes it much secure. The double zipper closure means that you can also padlock it. 21 inch high and 13 inches wide can fit much of your necessary items. Moreover, the five exterior zip pockets and two slip pockets can also be brought into use at any time. All of the color variety is available in less than $50. This is something worth for it. It is pretty much nice and durable though some customers complained of zippers getting stuck at times which is quite annoying. 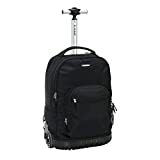 The Rockland 19 Inch Rolling Backpack is a great rolling backpack for adults as it is available in several colors which gives you a much better variety to choose from. The colors available are Black, Black Dot, Pink Zebra, Peace, Blue, Camo, Navy, and Owl design is available as well. Made out of polyester, this bag has inline skate wheels which are perfect for a good and easy transport. With a great storage space, this bag also offers built-in laptop compartment which makes sure that there is a separate storage for your laptop and it stays safe. Also, it has a side mesh pocket for holding small items. The bag is available in an ideal size of 13x10x19 inches. Also, it has a padded shoulder pad. Padded shoulder pads allow the bag to be carried comfortably on the back as an option. 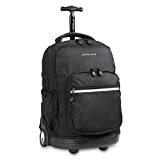 J World also has a great rolling backpack for you in the form of J World New York Sunrise Rolling Backpack. IT has an Ergonomic S-shaped adjustable shoulder strap and air mesh cushioned back panel which helps in providing the maximum comfort when wearing the backpack for extended periods of time. The best and unique thing about this backpack is the fact that it has a front pocket organizer which comes with pencil holders, card holders, a key fob, and a zippered pocket. Surprisingly, it also has a T-shaped telescoping handle, which is made of high-density PU coated materials and aluminum pipes. This ultimately results in providing a firm, comfortable, and maximum grip. The bag is 18.11″ high and 8.66″ wide. It is available in a wide range of more than 20 amazing colors to choose from. There are Soft and noiseless wheels for stable and controlled motion. Rolling backpacks are surely a necessity for all types of teenagers today. Get your rolling backpack today by ordering one from above and recommend to others as well by hitting the sharing button.